Forgotten by most, beloved still among those who remember, Pooyan was one of the most unique and challenging video games ever created. Legend has it that Donkey Kong Champion Billy Mitchell once spit a huge mouthful of Sunkist Orange Soda on one of these machines when someone asked him to give it a spin, but he’s always been jerk, hasn’t he? It wasn’t “manly” enough for him, apparently. Who was he trying to kid? You play video games, dude—you’re not exactly a smokejumper! Pooyan featured pigs and wolves. The pigs were adorable and good, the wolves were kind of adorable but very bad. 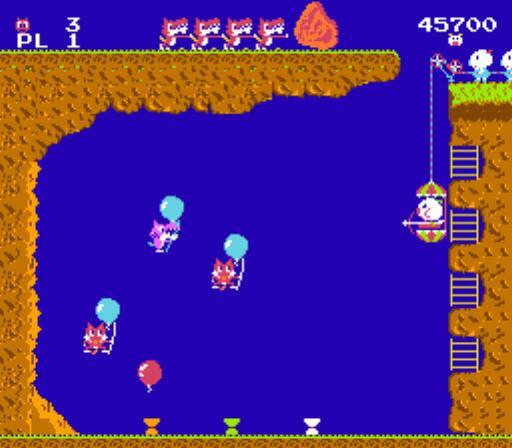 They kidnapped a few unlucky porkers but wanted more, so the pigs had to defend themselves by rigging up an ingenious gondola contraption, from which one of them could shoot arrows at the wolves, who used the more primitive method of hot air balloons to get at the pigs. An aerial battle royale! Pooyan was pretty much ignored by most arcade junkies of the day, which meant that if you did like it, you never had to wait around for the machine to clear. This was a good thing, because it was a lot of fun!